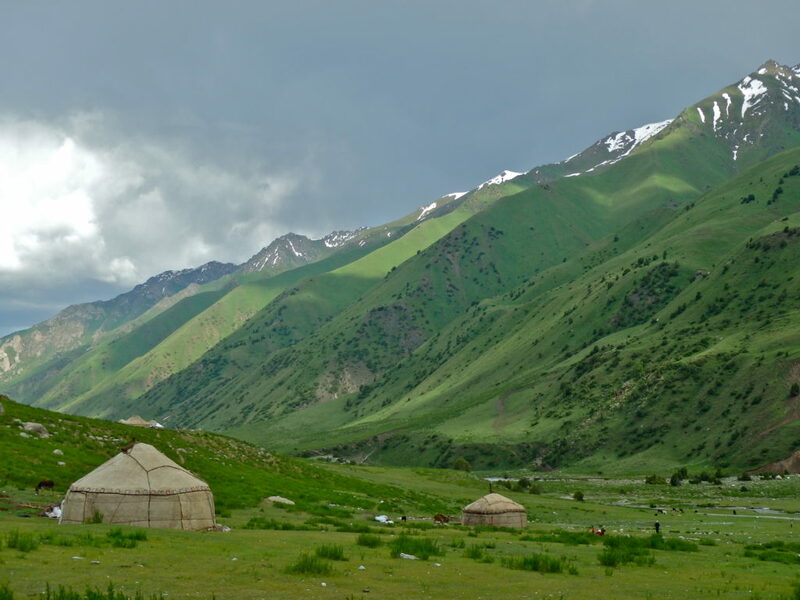 Not that many people have made it to Kyrgyzstan, but the buzz around this small Central Asian nation of mountains, nomads, and sheep is really starting to grow. Once you figure out how to properly pronounce Kyrgyzstan (Kurg-istan) and sort it out from Kazakhstan, Kurdistan, and the nonexistent Kajikistan, you will start to realize why this country has stayed hidden for so long, but also why it’s coming out as a destination for adventure travelers now more than ever. Most travelers come to Kyrgyzstan for the breathtaking scenery and never ending outdoors adventure possibilities. Hosting high altitude pastures, soaring summits, pristine lakes, and even a couple of ski hills, Kyrgyzstan is truly an outdoor-persons paradise. What most travelers do not expect when coming to Kyrgyzstan is how the national psyche, the diverse cultural customs, and the Kyrgyz identity are just as important to their experiences as those mountaintops. Landlocked and sandwiched between Kazakhstan, China, Tajikistan and Uzbekistan, the land that Kyrgyzstan now occupies has long been nomadic territory and has bounced between various empires and rule for centuries. Most recently, the Soviet Union reigned supreme. Since independence in 1991, the Kyrgyz people have been reconciling their nomadic traditions, Islamic religion, and Soviet-style bureaucracy, all in a democratic political system in the modern age. That is a lot of identity baggage! And travelers can actually experience and witness many of these layers during their trip if they are up for it. 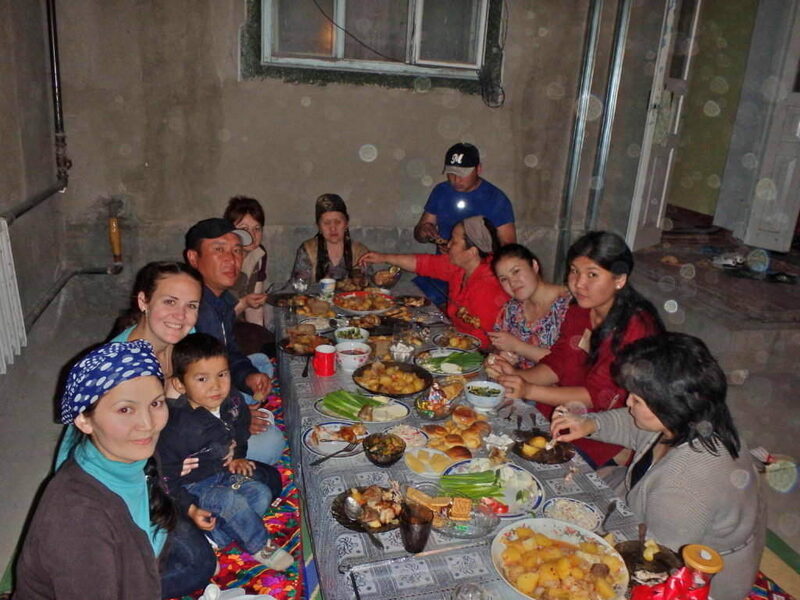 One of the first, and most Kyrgyz, experiences I had in my 18 months living in country was on my very first night with my host family. Struggling with my bags, I walked through the property gate and found myself face to upside down face with a dead sheep hanging from a tree. To my surprise, I had arrived during a ‘koi soi’, aka sheep slaughter. My host fathers father had passed away 5 years earlier and in his honor the family was having a celebration. A sheep is required for any real celebration in Kyrgyzstan. After my shock wore off, I helped the women prepare the sheep by cleaning the intestines. Welcome to Kyrgyzstan! Sheep are a massive part of Kyrgyz history and culture and are crucial to the survival of many families today. Sheep meat is the main source of protein for most Kyrgyz folks and is the primary component in traditional dishes. Almost every village family will own a few sheep if they can. From nomadic times, sheep were the main livestock kept by the tribes, as they would follow along easily as the people migrated around the country. Sheep is also a fairly fatty meat, which served the hard working and calorie burning nomads very well especially during those long winters. 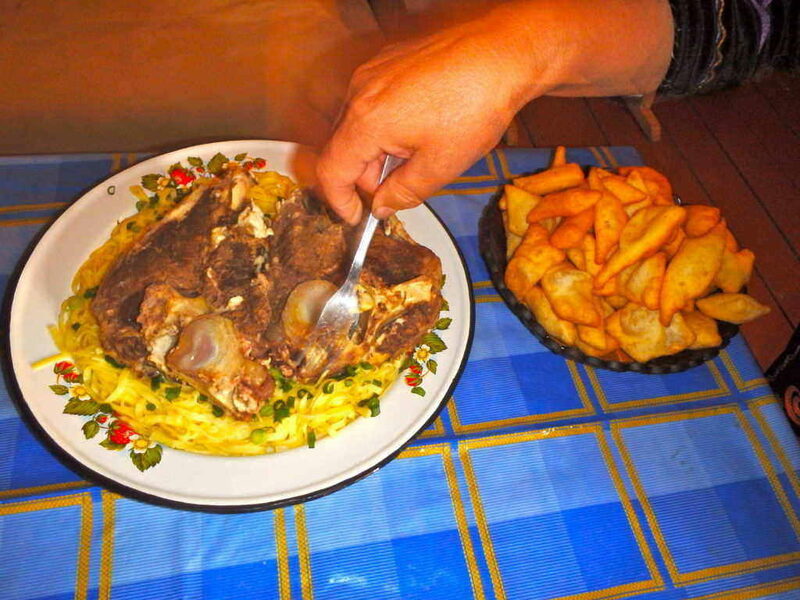 Today, Kyrgyz cooks believe that sheep, in particular sheep fat, makes you strong. Tenuous as this theory is, don’t try telling an old Kyrgyz woman any different! Related to a koi soi, is the concept of ‘konok’. Konok is Kyrgyz for ‘guest’. Guesting can be anything from stopping by a friends house for a cup of tea, to having the in-laws over for a birthday dinner, to having 50 people in your guesting room (built specifically for the cause) eating sheep and drinking vodka. Going guesting is an important part of Kyrgyz culture because of the tremendous value placed on hospitality and the welcoming of others, both friend and stranger, into your home. Every homes guesting room, no matter how small, will have a long low table with many cushions on the floor for everyone to sit down and be comfortable. Special dishes and treats are reserved for the use of guests in this room. The vodka and tea will continuously flow, one more dangerous than the other. Throughout the guesting, every one around the table will eventually offer a toast to the table, wishing the guests, or the guest of honor if there is one, the best of health, the most riches, and the largest flock of sheep. If you survive the vodka, there is so much food you won’t be certain your body can handle it. It will; the matriarchs of the family will make sure you leave full and with leftovers! for the top ventilation grill called a tunduk, so the darkness of the yurt and the serenity of the mountains allow you to sleep your altitude sickness right off. Part of staying in a yurt is again, eating! Fare in the mountains will often be a more traditional type, with yak milk yogurt, kumuz (a fermented mare’s milk beverage), and freshly baked bread. And tea and vodka. Many yurt stay experiences will bring you right up close with horse trekking or hiking, which are incredible ways to see the mountains and the countryside. But if you plan it right, you might catch some horse games. Horse Games are a major part of traditional Kyrgyz nomadic culture and are still practiced and played regularly today. The most famous of the Kyrgyz horse games is called kok buru, or as more foreigners may know it ‘the dead goat game’. You take between 2 and 200 men on horseback in any kind of open undulating hillside. You toss a headless goat carcass in the middle of the fray, and be it an individual or a team game, all of the players try to get that goat on their horse and ‘score’ in a designated area which could be a large tire, “that tree over there” or that guy in the blue hat. It’s basically polo, but with a headless dead goat as the ball, and with very few rules. Kok buru is a contact sport, for the players, the horses, and the spectators. People get grievously injured. I can’t imagine falling off a horse to be a fun thing, especially when you’re galloping among a crowd of 75 other galloping horses. Never let anyone say Kyrgyz culture isn’t a spectacle! 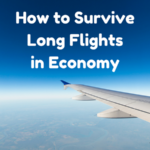 Nomadic tradition at it’s most exciting! The game is sometimes played in very structured ways, like during the World Nomad Games, but more often a game comes out of a bunch of guys with their horses feeling like having a laugh. And potentially breaking their necks. The crowd moves with the kok buru game, following the cluster of horses and men over hill and dale, always prepared to turn and run if the action all of a sudden comes in their direction. And “What is the prize for winning?” one may ask. Well if bragging rights, pride and knowing you’re the manliest guy above 2000 meters are not enough, the winner gets to keep the goat! Due to Kyrgyzstan’s Soviet past, most holidays in this country are based on either the season or politics, as opposed to religion like many Western or Latino countries. December 31st therefore has become the biggest and most important holiday of the year. Janga Jeel, or Kyrgyz New Years Eve, is the highly anticipated end to the year and the reason Kyrgyzstan comes alive in the middle of the long cold winter. Families travel from the cities back to the villages, and folks from abroad come home for the holidays. There are decorations galore and families spend a small fortune on food and drink for the evening of the 31st. There is also a Halloween type element; parents buy various costumes for their children like princesses, bears, pirates, and mermaids. School children put on holiday pageants, dressed up in these costumes. I attended the class pageant of my home stay sister, who was 8 at the time and dressed as a princess. 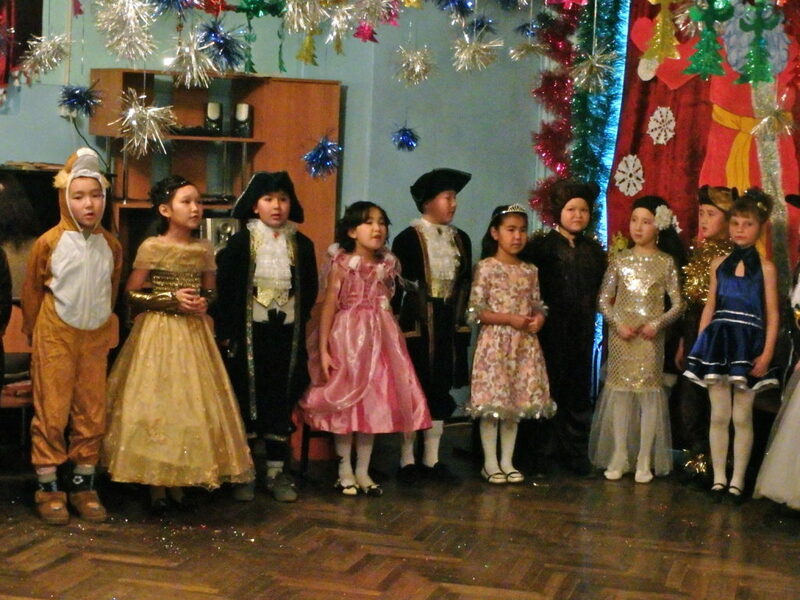 The class sang wonderful Russian songs, recited Russian poems, danced (my favorite dance was the 7 pirates who danced to Backstreet Boys ‘Larger than Life’ and made great use of their toy pistols), and had a number of competitions. My favorite competition was the orange eating competition, which my sister Akmaral really excelled at. While gift giving is not a custom like for Christmas, there is a Santa Claus-ish character named Father Frost. He looks strikingly similar to St. Nick, but he wears blue and white and is the spirit of winter. He is slightly intimidating. The evening of the 31st, the family is all together and goes between eating, resting, and drinking. Once everyone is seated at the guesting table, the spread is a true sight with food and treats for days. The champagne bottle pops and everyone (even little Akmaral) partakes! At midnight, the fireworks commence at almost every house and phones start buzzing from friends and family afar. 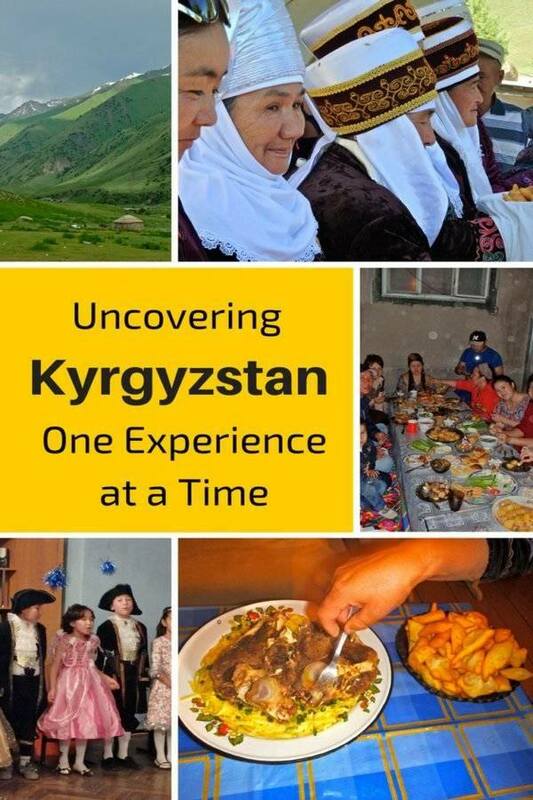 Experiencing the true Kyrgyzstan isn’t always easy. It will definitely take a bit of luck and asking around to see what is going on. But Kyrgyz people are overwhelmingly friendly, and the youth are very eager to practice their English, so meeting someone to take you guesting shouldn’t be a problem! 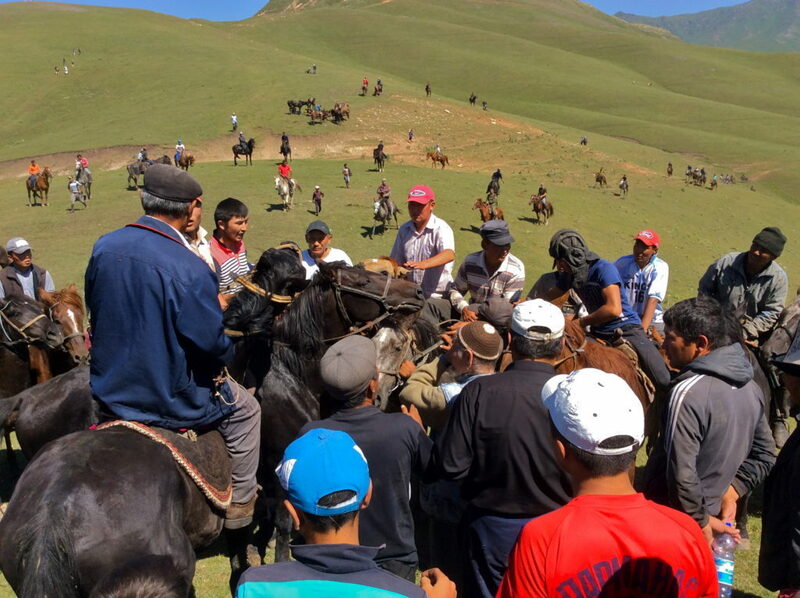 Kyrgyzstan’s Community Based Tourism system can hook travelers in with horse games festivals and yurt stay opportunities as well as the outstanding outdoors exploration trips. Kyrgyzstan is a country unlike any other due to its history, identity, traditions, landscape, and present challenges. As more travelers discover this emerging nook of the world, summiting Peak Lenin won’t be the true destination as much as understanding the long lasting imprint Kyrgyzstan and it’s people will have left on you. Emily Kydd is a Canadian solo female nomad and editor of the blog See Her Travel. 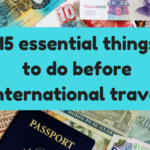 Exploring this world to diverse countries such as Kyrgyzstan, St. Lucia, Nepal, Myanmar and Fiji, Emily loves discovering new cultures, meeting wonderful people and having a laugh while on the latest crazy adventure. Follow her on Twitter, Facebook, Pinterest and Instagram. Wow, such an amazing experience. I really enjoyed hearing about how life is so different there. The sheep, sleeping in a yurt, the horse games, school life, and the holidays, each photo tells a story. Very nice post. What an incredible adventure! I would love to see some of these things firsthand. Definitely going to have to add it to the list. I want to go for so many reasons after reading this article and staying in a yurt in the mountains is high on that list! What a wonderful cultural experience! Such an incredible opportunity to see and live through the eyes of a local family. I am sure this is something you will never forget!